It might take you few seconds to figure out exactly what you're looking at. 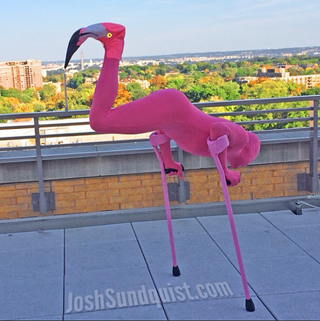 It's former Paralympic Games ski racer Josh Sundquist, unveiling this year's edition of his always-great Halloween costume. Sundquist, who lost his left leg to cancer when he was 9, now works as a motivational speaker and author. He competed for the 2006 U.S. Paralympic team in slalom and giant slalom, and has also made the roster for the U.S. amputee soccer team. He's retired now, and his thing is creative Halloween costumes that only he can pull off.